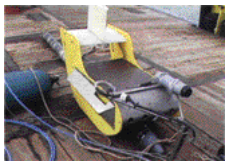 By mounting a magnetometer on a Chelsea Instruments’ NuShuttle undulating towed body, Holland ’s Rijkswaterstaat was able to locate buried wrecks that could not be pinpointed by conventional seismic techniques. THE WESTERSCHELDE, in the South West of the Netherlands, is the waterway connection between the Port of Antwerp and the North Sea. Broadening the channel would allow larger seagoing vessels to reach the Port of Antwerp. However, dredging of the channel could not be started because Dutch records showed a great number of shipwrecks in the Westerschelde area which would have created a hazard to the dredging works. But the exact location of the wrecks was not always recorded which led the Zeeland Division of the Rijkswaterstaat decide to identify all shipwrecks in the Westerschelde and relocate them before dredging began. The dedicated survey vessel Lodycke was equipped with various sensors, including a multibeam sonar and a Klein sidescan sonar. Accurate positioning information was obtained by RTK DGPS and PosMV heave compensation. The exact position of the sidescan towfish was determined by means of an acoustic transponder on the towfish which was tracked by the vessel’s USBL system. A l l positioning information was merged and an exact position for the different sensors was calculated by NeSA’s PDS software. Sidescan sonar data was logged and displayed using a TEI Isis sonar acquisition system. This survey spread had one drawback. It was able to locate wrecks sitting on the seabed or partly covered by sediment but did not have the capability to look beneath the seabed. Buried wrecks could not be located but these would be the biggest hazard to dredging operations. The Westerschelde is known for its diverse geology. Large quantities of heterogeneous sands make it virtually impossible to retrieve subsurface information from the area using standard sub-bottom profiling or chirp systems. Even shallow seismics proved to be unsuccessful. The use of a magnetometer appeared to be the best alternative. A magnetometer is a passive survey instrument: it does not send a signal itself, it only “listens” to signals it picks up in the water. As we are aware, the earth generates a magnetic field, which in a small enough area can be assumed to be constant. If a magnetometer is deployed in this area, the measured values will be more or less constant. However, when an object is placed inside the earth’s magnetic field, it will cause an anomaly which shows up in the data as a peak value. This is usually visible by plotting the dataset. A peak value caused by an anomaly is not always of the same shape and size – even for the same object, the magnetometer will not always produce the same anomaly size and shape. Contour maps of magnetic anomalies yield more information than separate line graphs but can only be achieved if the height of the magneto meter can be accurately controlled – in this case by mounting it on the towed body. The size of this anomaly depends first of all on the material the object is made of. Metal objects will have a far greater effect on the magnetic field than, for example, those of plastic or wood. And while bigger objects can be expected to cause a bigger disturbance compared to a smaller object, the type of material, its size, shape, depth of burial and the direction of the magnetometer crossing the object have a big influence on the size and peak shape of the anomaly. Crossing an object from the opposite direction may cause the peak value to be negative instead of positive. Finally, the height of the magnetometer over the object will influence significantly the size and shape of the anomaly value. For example, a large totally buried object may produce the exact same peak value as a smaller object just below the surface. All these parameters may be a reason for not detecting an object or for misinterpreting a magnetic graph. It is therefore of the utmost importance that the survey crew has control of some if not all of these parameters. Of course it is not possible to control all parameters. The size, shape, material and depth of burial of the object cannot be controlled externally! But if the remaining parameters, such as the height of the magnetometer over the seabed can be controlled with a large degree of accuracy, estimates can be made of the object’s shape and size and maybe even the depth at which it is located. The SeaSpy/ Nu-Shuttlecombination means height is controlled to centimetric accuracy. All this sounds well in theory; how was it accomplished in the real world? 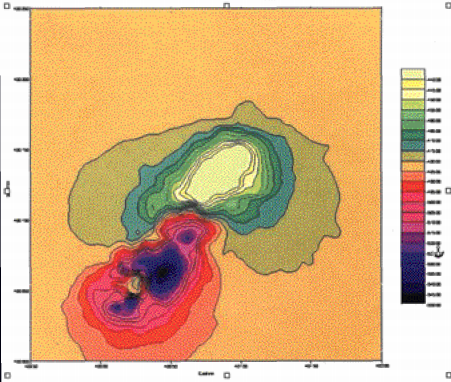 As previously stated, a magnetometer detects disturbances in the earth’s magnetic field. But because most ships are made of metal the sensor will also detect this signal. So the anomaly from the survey vessel will show at a very high level, causing other anomalies to be lost in the noise. However, if the magnetometer is moved further from the vessel its influence will decrease significantly – as a rule of thumb, the survey vessel ’s influence is negligible at three times the ship’s length. The magnetometer selected for the job, a SeaSPY by Marine Magnetics Corporation is an Overhauser magnetometer capable of detecting very small anomalies of the earth ’s magnetic field. This is required when a sediment-covered wreck consists of several pieces of various sizes. Additionally, the Overhauser Effect enables SeaSPY to operate at very low power levels, while maintaining its high sensitivity. The unit is powered via the towcable and data is returned to the data acquisition unit, The magnetometer selected for the job, a SeaSPY by Marine Magnetics Corporation is an Overhauser magnetometer capable of detecting very small anomalies of the earth’s magnetic field. This is required when a sediment-covered wreck consists of several pieces of various sizes. Additionally, the Overhauser Effect enables SeaSPY to operate at very low power levels, while maintaining its high sensitivity. The unit is powered via the towcable and data is returned to the data acquisition unit, in this case NeSA’s PDS 1000. The PDS software logs the magnetometer data into a file for later charting. Graphs of the data can also be made using PDS software. Unfortunately, graphs of separate lines alone do not give sufficient information on anomalies. More information can be retrieved from contour maps, where several lines are combined to produce a contour plot, but this is only possible if the height of the magnetometer can be accurately controlled. Furthermore the towfish position has to be known. In consequence, what was needed was a stabilised, controllable platform. After appraising a number of vehicles, NeSA and Rijkswaterstaat chose the Chelsea Instrument Nn-Shuttle. By fitting the SeaSPY magnetometer to the Nn-Shuttle, its height can be controlled to centimetric accuracy by using the PDS 1000 software. Together with the USBL transponder mounted on the Nn-Shuttle, this resulted in a magnetometer that was controllable and from which highly accurate positioning information could be acquired. Using this specialised wreck finding tool, the Lodycke survey crew was able to locate all the wrecks. After clearance they re-surveyed the area using the magnetometer to confirm the salvage team had completed this work. This way a final check was made to make sure all parts of the wrecks were removed properly. The combination of the Chelsea Instruments Nn-Shuttle and the Marine Magnetics SeaSPY magnetometer was so successful that shortly afterwards another Rijkswaterstaat division decided to invest in the same combination of Nn-Shuttle and magnetometer. They intend to use the system for wreck surveys in the North Sea. After successfully using the SeaSPY/NnShuttle combination, the Zeeland Division of Rijkswaterstaat expanded the system with a second SeaSPY magnetometer, creating a stable, highly controllable transverse gradiometer for even more precise measurements. The Chelsea Nn-Shuttle and the Marine Magnetics’ SeaSPY magnetometer have proven to be a useful tool in wreck detection surveys and made it possible to not only check the seabed surface but also below for wreck debris. Chelsea Instruments’ Nn-Shuttle towed undulating vehicle was developed in cooperation with Plymouth Marine Laboratory under the DTI’s Support for Products Under Research (SPUR) scheme. There are now over 25 Nn-Shuttles operating worldwide. Among Nn-Shuttle attributes are that it is capable of undulating deeper than any other towed vehicle of its type with or without faired cable. It also offers a highly responsive and easily controllable undulating system and it is this attribute that was utilised by NeSA. The full range of Chelsea’s towed undulating vehicles (from large carriers capable of undulating down to 500 metres, to vehicles designed for deployment from smaller towing vessels and ships of opportunity) include SeaSoar MkII, ScanFish MkI & MkII, AQUAshuttle andNn-Shuttle. Nu-Shuttle with USBL transponder on its port bow and magnetometer underneath.